I have a hard time resisting the call of the ~new~, especially now that my job gives me access to a lot of ~new~. That makes these ~old~ products even more special. I keep them buying over and over, because they’re worth my loyalty. I was inspired to write this post a few days ago, when I pulled yet another refill bag of my cleansing oil out of my literal skincare closet. My cleansing oil is also the most recent addition to my elite group of constant repurchases, so that’s where we’ll start. Where we’ll finish is with the product I’ve been using consistently for the longest–several years at this point! 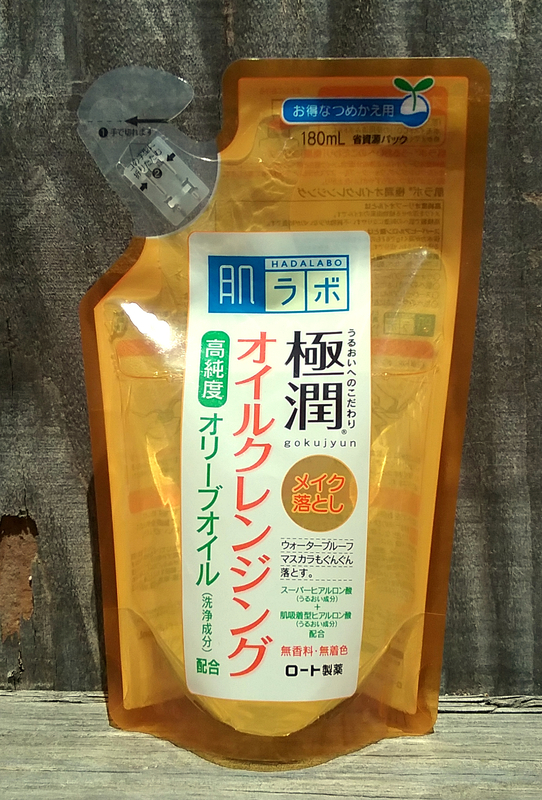 Canada has bags of milk; Japan has bags of cleansing oil. I’m lactose intolerant, so guess which one I prefer. Yes, there are fancy cleansing oils that I love more, but when I can get over my fiscally irresponsible craving for things that smell good and have exciting herbal ingredients even though all that stuff just washes right off when it’s in a cleansing product, I have to admit that there’s a lot to be said for an inexpensive, frills-free, but well formulated cleansing oil. Hada Labo Gokujyun Cleansing Oil is a stellar example of this. It’s just the right thickness for me, with plenty of slip to make massaging away makeup and sunscreen comfortable and easy. It emulsifies well with wet hands and rinses off fine. The refill bags make my frequent repurchases a little more eco-friendly. And it’s dead cheap. I use it as my first step evening cleanser as well as my brush and puff first cleanser, and I’ll keep buying it until it’s unavailable. Minor cons: It doesn’t smell pretty (it doesn’t smell like anything in particular to me), and it isn’t the cleanest-rinsing cleansing oil. The little bit of residue it leaves behind doesn’t bother me, though. It comes off just fine with my second cleanser, unlike, say, Heimish cleansing balm residue. Also, after a few refills, I do get the urge to purchase a fresh bottle instead of another refill bag. Constantly reusing the one bottle starts feeling like I’m drinking from the same water bottle without washing it for months, except even worse because what’s in the bottle goes on my face. Times repurchased: 9? 10?? I go through sunscreens fast! If this came in a jug, I would get the jug. The existence of this sunscreen makes me 60% less pissy about the 2017 reformulation of the old Biore UV Aqua Rich Watery Essence that I loved so much. 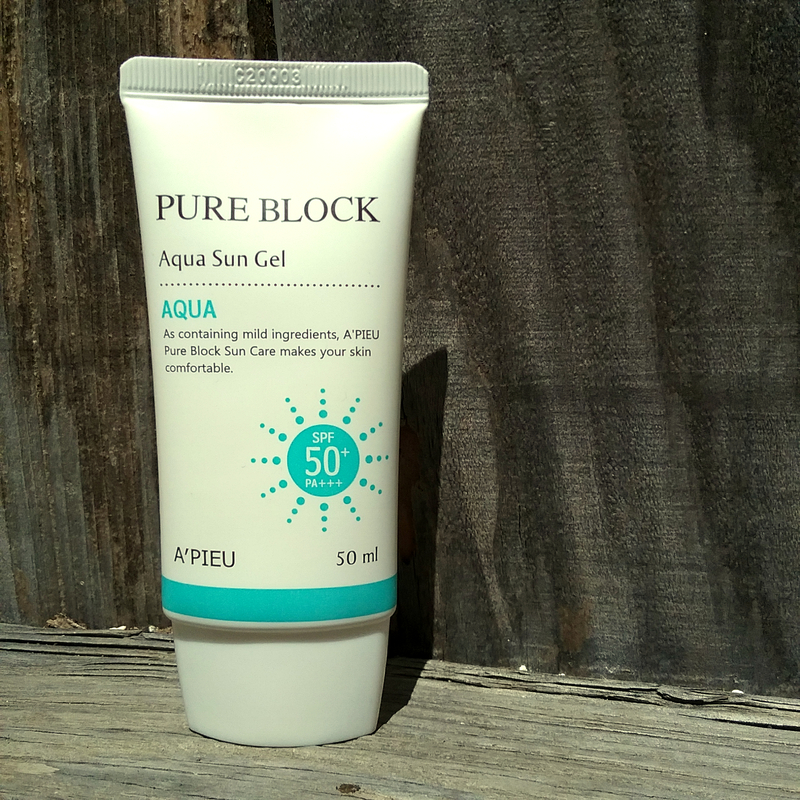 A’Pieu Pure Block Aqua Sun Gel is a worthy replacement. It dries down totally clear and super lightweight, and it smells lightly citrusy rather than sunscreeny. The formula moisturizes just enough for me to get away with skipping moisturizer on hurried mornings, yet also sits nicely on top of moisturizer when I do have the time to apply that. Basically, it’s sunscreen that doesn’t look or feel like S U N S C R E E N. Winner. As another bonus, I believe that A’Pieu Pure Block Aqua Sun Gel may protect better than that 2017 Biore UV Aqua Rich Watery Essence. I routinely glob sunscreen on the top of my left foot as part of an extended skincare experiment there. I had no flip-flop tan lines on that foot when using the A’Pieu for months, but after a couple of weeks when I was determinedly giving the Biore yet another chance because I never learn, I developed some pretty distinct ones. That made me 40% more pissy again, because it’ll take ages to fade those now. Lately, I do also like Earth’s Recipe Waterful Sun Gel, but that sunscreen does best on me if I’ve moisturized underneath. 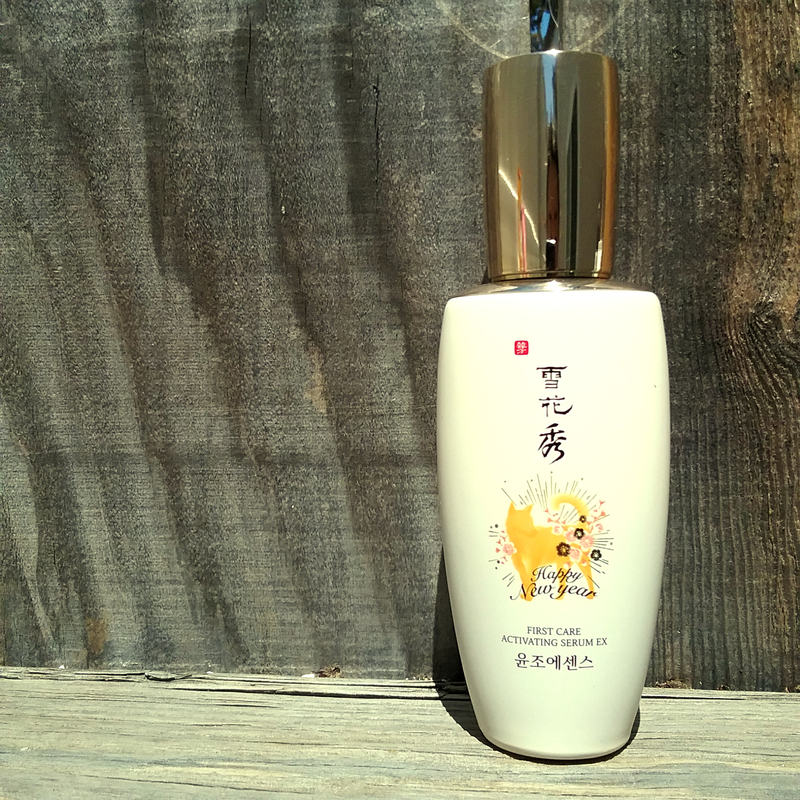 The A’Pieu can double as day moisturizer for me, so it comes out on top. Minor cons: This will not be suitable for people who can’t use chemical sunscreens, isn’t water- or sweatproof, and doesn’t come in giant jugs. The fact that the dog looks like it’s farting out fancy flowers is part of the charm of this year’s packaging. Yes, I still huff this like it’s a can of silver spray paint and I’m the boy from About a Boy in the Charlize Theron and Tom Hardy masterpiece Mad Max: Fury Road. More importantly than the First Care Activating Serum EX’s absolutely magical and perfectly balanced hanbang scent (the nicest out of all Sulwhasoo products, in my nose’s opinion), though, is its effect on my skin. I recently traveled away from home for a while and didn’t bring the FCAS EX with me, because I was trying not to let my cosmetics take up 70% of my luggage the way it normally does. I got my skincare down to only about 20% of my total luggage volume. My skin, consequentially, got the shaft. Within a couple of days, the rosy glow I’m used to had almost totally vanished from my cheeks. By the time I came home, I looked positively drained despite having eaten and slept so much more on my trip than I do at home. Picked my First Care Activating Serum EX back up, and the rosy glow returned not long after. This happens every time I discontinue use of this product for a while. The effects of the First Care Activating Serum EX are so unusual to me that it’s completely replaced the more typical fermentation-based first essences I used to use in this step of my routine. I have plenty of other skincare that can brighten and provide translucency but no others that stimulate that lively flush the way this product does. Minor cons: It’s expensive, the complex ingredients list has a higher than normal chance of containing triggers for more sensitive or reactive skin, and also, really, it’s kinda expensive. Confession: I cleaned quite a lot of wild lizard poo off of this fence before it was habitable for photography. I know it was lizard poo because we’ve owned lizards before and I can spot their poo a mile away. You’ll be pleased to know that based on the appearance of their poos, our neighborhood lizards are in very good health. Sheet masks are one category where you’d think loyalty might be a challenge. There are so many options, and the cost to try new things is typically very low. 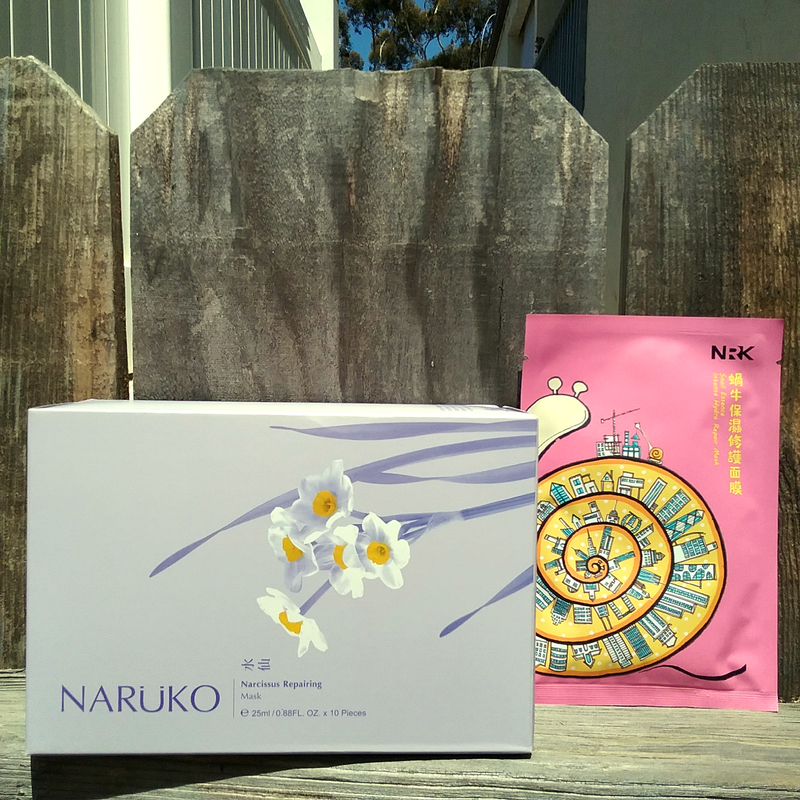 Despite all the temptations staring me in the face on a daily basis, however, I keep coming back to my old T-beauty favorites, Naruko Narcissus Repairing Mask and Naruko Snail Essence Intense Hydra Repair Mask. With its velvety-feeling, medium thickness pulp sheet and excessive amounts of essence, the Narcissus Repairing Mask feels typical of Taiwanese sheet masks. A good session with this mask gives me results that go way beyond typical, though. The narcissus mask firms and brightens my skin like few others can and leaves my complexion plump and glowing through the next day. I highly doubt it’s repairing any DNA because that would be a huge science headline, but it certainly gives the appearance of having done so. The Snail Essence Intense Hydra Repair Mask, on the other hand, is not a typical Taiwanese sheet mask. Though the mask sheet material is about the same as the Narcissus Repairing Mask, it’s coated in an extremely thick, bizarrely slippery, slimy-feeling gel. Somehow that gel sinks right into my skin and leaves it totally matte and non-sticky afterwards. And these masks leave my skin so calmed that it looks like I have makeup on when I take the mask off: even-toned, no blotchiness to be found. Minor cons: The slippery nature of the snail masks have caused me to drop a few in the sink and on the floor. Also, I’m not a fan of the heavy baby powderish smell of these. I can’t think of any complaints, petty or not, about the narcissus masks. 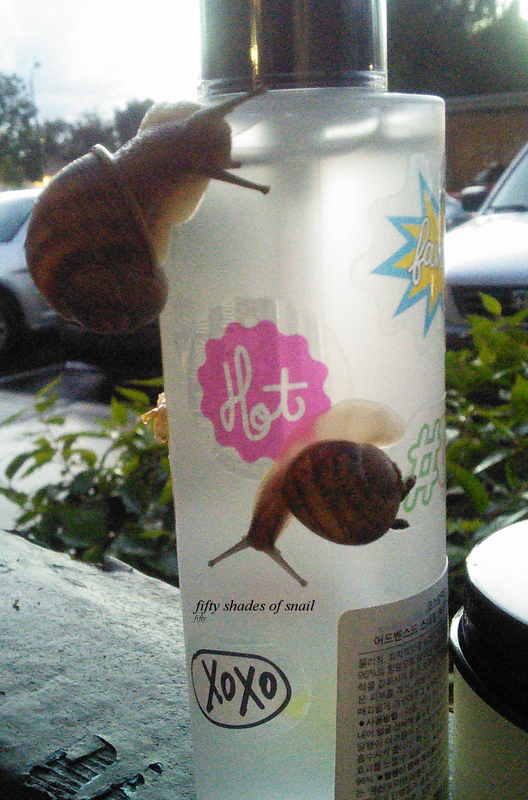 Reusing this photo because I’ll never top my snail photo shoot. Snail mucin is practically mainstream these days. There are a ton of snail products. I happen to have tried many of those snail products. I haven’t found any other snail product that I prefer to this scentless wonder. The thing about many snail products on the market is that they’re typically multipurpose. They’ll have the snail, but they’ll also have brightening agents in them, or a bunch of extracts, or other ingredients intended to add to the effects of the product but that, for me, only detract from the star: the snail. COSRX Advanced Snail 96 Mucin Power Essence, on the other hand, seems to be nearly all snail. All snail, all business. This is about as close as I imagine one can get to just slathering straight snail slime on one’s face, straight snail slime in all its wonderfully soothing, smoothing, healing, resilience-boosting glory. Using this product keeps my skin soft at all times and, after any product reactions or breakouts, helps it heal quickly. There’s nothing in the simple ingredients list to irritate my face and undermine the snail mucin’s calming powers. It’s pure comfort in a bottle. Minor cons: Due to the thick consistency of this essence, it takes a little while to fully sink into skin. People unused to snail products may also find its slimy texture repulsive. They’ll learn. It’s small but so powerful. Yep, I’m still on Curology. In fact, I’m still on the same prescription that I have been for a couple of years now: 0.07% tretinoin, 5% MAP vitamin C, 4% niacinamide. I haven’t changed my prescription in ages because I see no need to. My first year on Curology was the reparative year, when regular use of the prescription helped reverse most of the early sun damage I inflicted on myself by going to tanning beds and never using sunscreen properly in my twenties. For the past year or so, on the other hand, I’ve been in maintenance mode. I literally don’t see any areas left that I want to change. The Curology restored firmness to areas of my face that were starting to lose their sproing and faded the big patches of sun spots on my cheekbones dramatically. Tretinoin is a powerful and proven anti-aging topical that has worked wonders for me. Of course, Curology isn’t the only tretinoin game in town. But the fact that Curology offers several different concentrations means that you can start with a very low dose and therefore mitigate the face-melting, skin-peeling side effects that harsher prescriptions are notorious for causing. Even with my complaints about tretface back in the day, I had it much easier than many people I know who started with more conventional tretinoin creams. Because I’m terrible at remembering to restock things before they run out, I also appreciate the fact that a fresh bottle arrives in my mailbox every month through no effort of my own. Minor cons: Can cause dryness and definitely causes photosensitivity, so be sure your sunscreen game is tight before starting any tretinoin or other retinoid. Sometimes the cream dries in the pump and creates an annoying little product booger that then shoots forcefully out of the pump and sprays a vulgar smear of product all over the bathroom. I’ve been thinking a lot about aging and the passage of time recently. 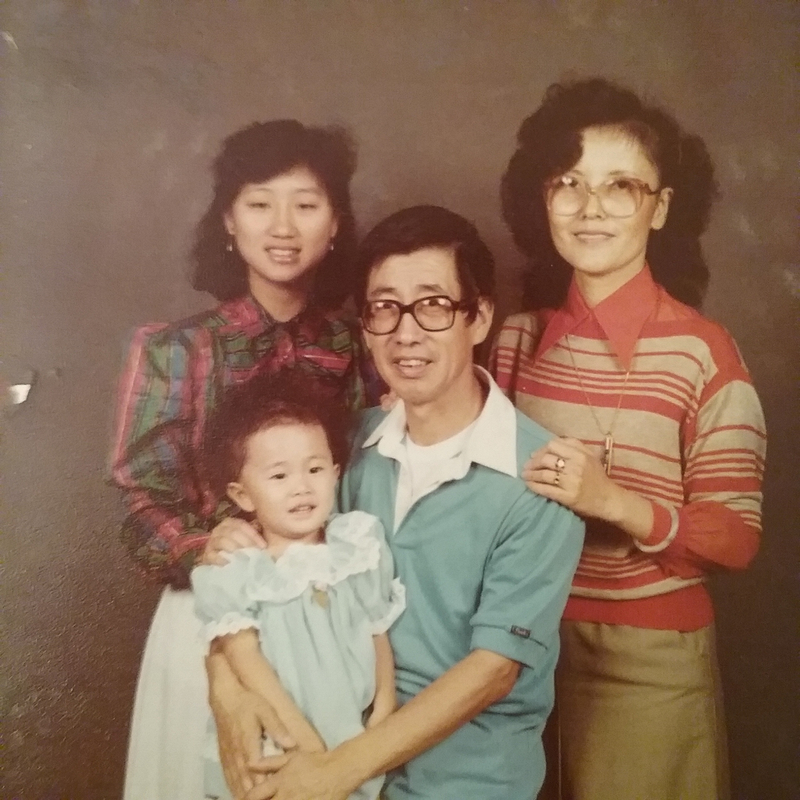 On the trip I referenced earlier in this post, I was able to hang out with many relatives I haven’t seen in years, including some of my favorite cousins, who were a major presence in my childhood. Being around them made me realize how much time has passed. I’m in the auntie generation now and pushing forty. The thought doesn’t freak me out the way it used to. I’ve made my peace with my age existentially; in fact, I’m loving it. It makes me look at my skincare differently, too. I don’t feel like I’m “fighting” visible aging anymore–at this point, it’s more about just maintaining what I’ve got, because what I’ve got already makes me happy, and we defend what makes us happy. My skin feels healthier and more resilient than it did in my early thirties, and it looks brighter and smoother. I’m not chasing some doll-like ideal of Photoshopped perfection anymore: my skin condition is already better than it was when I was ten years younger, and I just want to keep it as healthy and glowing as possible for as long as I can, not for anyone else, but because it pleases me. I’m the very small and very permed one in the front. Curious about what’s in my active use skincare stash? You can check out my full lineup (finally updated!) here. That Klairs one SUUUUUCKS, right?! I am feeling really good lately and I will do my best to post more frequently than once every few months! I actually have a draft of an MBD mask almost finished too, so yay! (realised I had my really old name, so it’s still the same person haha) IT IS SO BAD. There were so many reviews that liked it, so I got it, and then pretty much as soon as it arrived I somehow came across yours – dunno why I hadn’t seen it earlier – and the feeling of dread set in, which was confirmed after just one use. Ughhhhh. And no pressure, but I do love your reviews 😉 Can’t wait to read it! Ahaha that feeling of dread…I get that a lot! I promise I am going to be better at posting reviews. I feel like I’ve finally got this work/blog thing down. For a while I felt really overwhelmed about the idea of talking more about beauty after spending all day dealing with beauty, but something seems to have shifted and I’m super excited about everything again! Now I’m worried. I really like Klairs. It was the first product I’d tried and I loved it. But I haven’t tried that many other cleansers so maybe I’ll branch out a bit. I really love these sorts of posts; it’s always fun to get a review of a new product, but when something just works, it’s cool to see it getting more recognition. Also, those Naruko Snail masks are incredible. I love how saturated they are and the results always beat every other product at multiple price points by a long shot. I’m going to give the Narcissus ones a go in my next sheet mask stock-up! Thanks for the great post and the great recommendations as always! Thank you for reading!! I hope you like the Narcissus ones as much as I do. It’s quite refreshing to see you talk about aging in this way! I’ve also recently started to feel the same way about the poreless porcelain look and — especially as someone with genetically terrible skin — how unrealistic that ideal is for me. That’s not to say I won’t be doing skincare anymore, I’ve really just come to reevaluate my relationship with it. It’s no longer something I do so that I can look like an airbrushed celebrity who’s getting two laser resurfacing treatments a year, I’m doing skincare because my skin feels much better than it ever has! I’ve stopped using terrible exfoliants and harsh cleansers, my skin doesn’t feel dry and ashy anymore! I still get the occasional pimple — heck it’s more than occasional! But I!don’t!care! My skin’s never going to be perfect, but then neither is anything else in my life, so why do I care about it so much!? I know I’m doing the best I can with my skin and, for me, that’s enough. I think that skincare and beauty can sometimes be really problematic topics, especially as we discuss concepts like “anti aging,” and it’s worth it to reflect on what exactly we’re trying to achieve and what we think that will bring to our lives. There are a lot of unrealistic ideals out there, but if we can change the way we approach those images in relation to how we take care of ourselves, it is really instructive! I have and I do like them quite a bit! I think I’ve only really tried things inn the smaller travel sizes so haven’t been able to review properly, but I am getting a full size of either the rice or barley jelly mask for summer for sure and probably one of the cleansers too! Do you like the Kose a lot? I don’t remember it super well. I’m a few years older than you and I’m more relaxed now that I’m in my forties. I’m not trying to be wrinkle free, I’m aiming for strength and clarity. I take good care of my skin and will continue to do so. I’ll probably always look “good for my age” for that reason but the extra lines don’t bother me much, certainly not enough to get injections or go under the knife. That is a great attitude to take and I agree! Totally awesome article! I just signed up for the Cureology trial after being very curious about their product. Do you have any hyperpigmentation or hypopigmentation? I struggle with them both after my hysterectomy and subsequent use of hormone replacement therapy. I certainly did, especially after pregnancy. Genetics + very poor sun protection practices + a lot of time spent outside meant I got hit with nice big patches of melasma. I’m also very prone to freckling from the sun anyway. I found that my Curology prescription and copious amounts of sunscreen faded all that quite substantially over time! Hey, I know you! Cosrx is one of my favorite brands of course! Hi Fiddy, is the Naurko Face Renewal Miracle Essence no longer a fave? I will always have a soft spot for it and my review of it still stands! (Also I have a backup bottle in my closet to go back to when I want!) It’s more that I don’t feel as much of a need for the brightening effect anymore and prefer the effects of the Sulwhasoo first serum currently. I love having that soft pink flush naturally! Hi. I’ve just discovered your amazing blog. I got interested in Curology product.. unfortunately (as I understand), they’re available only for US residents? I wonder if u could recommend me similar product to Curology? I am looking for something that will restore firmness on the areas of my face (cheeks – nosolabial folds) and help with patches of sun spots on right side of my face (they appeared after first sunny days here, in Poland where I live) as well as wrinkles under eyes. Best regards from Europe ! The key ingredient in my Curology prescription is tretinoin, so that would be what you can ask your dermatologist for. Over the counter, you can also try retinol or another retinoid. They are all vitamin A derivatives with similar effects at varying strengths, with the prescription ones being strongest of course. Just make sure to always use sunscreen in generous amounts while you’re using any retinoid! Thank you for answering. I had been using retinol+retinoid serum during the winter, maybe I will continue treatment in the spring. My only doubt is effectiveness of the sunscreens. I am cautious beacuse of this year’s sun spots. Can you recommend me sunscreens that worked good on you? Hey Fiddy! Was recently introduced to Korean facial care by my daughter. Your site is my go-to for learning and finding new products. 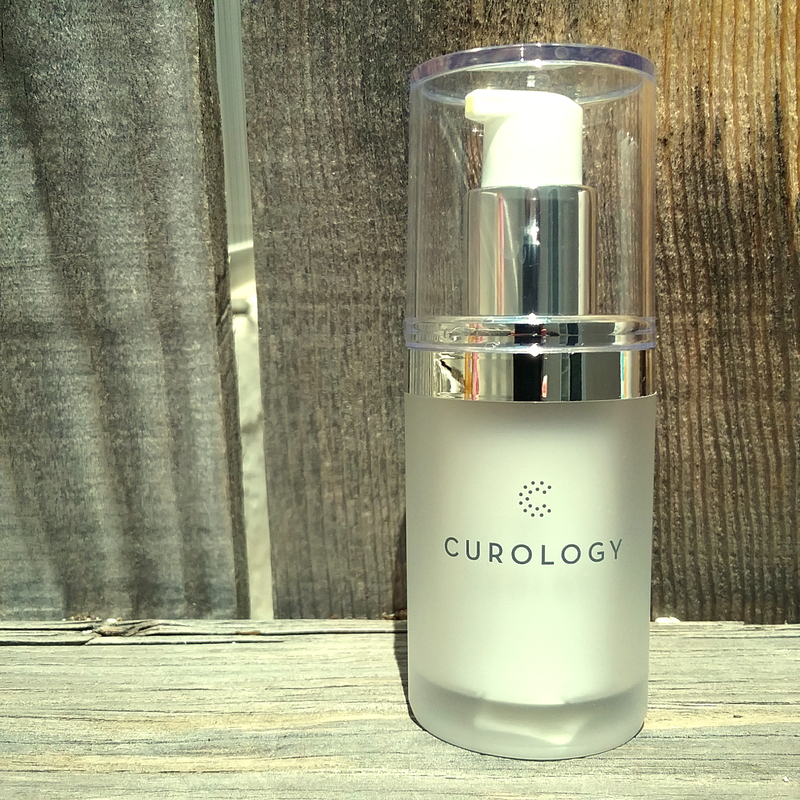 I was recently interested in trying Curology for anti aging. But your link is expired! If you can get a new one for the free trial I would like you to get the credit, you are the reason I want to try it. Thanks so much! I ordered A’Pieu’s Sun Gel from Amazon trying to replace the previously perfect Biore Watery Sun Block (2015) formulation. However, it looks like it was reformulated, too. It feels slightly greasy but does dry down. But the smell is like the old Sea n’ Ski from the 60s. I hate it! One of the things I loved about Biore’s Watery Sun Block was the smell was not awful. Help!